One final read I completed on my break between semesters in my PhD program was a very recent analysis of The Lord of the Rings that I enjoyed very much. An Encouraging Thought: The Christian Worldview in the Writings of J.R.R. Tolkien was written by Donald T Williams. It was published by Christian Publishing House in 2018. Williams makes it his mission to understand why indeed this is an encouraging thought, and he begins with five key motifs that help tie together the plot of this trilogy: darkness and light, the strength of weakness, sacrifice, Providence and Christlike heroes. By looking at these five aspects, Williams allows the reader to draw connections as to why hope exists even in our world that may seem particularly dreary at times. I think that is what I particularly enjoyed about this work as compared to the other two books on Tolkien I recently went through. As I read Williams’ thoughts, I couldn’t help but think about how beautiful The Lord of the Rings actually is. As he says in his conclusion, “I hope they will thus come to be able to find the light that still shines even in their own darkest places. I hope that vision will give them the same hope it gave Sam.” I know that it did that for me. It helped remind me of the beauty of the trilogy and the impact that it can have on my life and the lives of others. We always need to remember when reading J.R.R. Tolkien that there are deep themes embedded in the narrative, a point that Williams made clear to me. If we do not recognize these biblical motifs, as a secular audience more easily could, then we are going to miss out on a large part of what this book can give us if we are able to accept it. 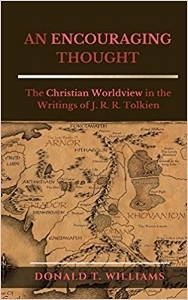 Donald Williams, An Encouraging Thought: The Christian Worldview in the Writings of J. R. R. Tolkien (Cambridge, Ohio: Christian Publishing House, 2018), Kindle Locations 1362-1363, Kindle Edition. During this well-deserved (at least in my opinion) break between semesters in my PhD program, I did some reading through some of Lord of the Rings commentary. I love these books so much that I thought it was worth seeing what other people had to say about them. A second book I read was The Philosophy of Tolkien: The Worldview behind The Lord of the Rings by Peter Kreeft. It was published in 2005 by Ignatius Press. This is a very different type of commentary on The Lord of the Rings. Kreeft has created a reference tool that asks 50 large questions that need to be addressed on the level of the worldview. Then, through the writings of Tolkien himself along with many others who influenced him, those questions are answered. Some questions are “Why must we be heroes?” and “Is evil real?” Clearly, these are big philosophical questions that have a rich intellectual tradition beyond the scope of The Lord of the Rings. Kreeft points out in the introduction, and I largely agree with this assessment, that one of the primary ways to use this book is as a concordance. As you all know, I like to write about The Lord of the Rings quite often, so if I need information about a particular topic, this resource would be incredibly useful. It is well organized and well written without a doubt, but I think that it is absolutely most useful as a research tool. It is a good read as well, but I don’t know that that is where its chief value lies. In fact, to reinforce this opinion, the author provides a literal concordance in the back of the book to help people such as myself trace the answers to the questions he discovered back to the source material in The Lord of the Rings. That is extraordinarily useful again for researchers. Sometimes, it can be difficult to find a collection of thoughts on a specific topic, but this sort of appendix will certainly help me with that. Again, I don’t say this to diminish the readability of the book or anything like that, but this book was created to answer questions, and that is what it does best. At the end of the day, I would certainly recommend this book to anyone who is serious about getting to the root of J.R.R. Tolkien’s worldview. One minor criticism I have is that Kreeft spends a lot of time also using examples from the writing of C.S. Lewis. I do see the value in this given that the two men were friends, but in a book on the philosophy of J.R.R. Tolkien, I think that we should probably stick closer to just him rather than utilizing Lewis quite as heavily. Nevertheless, I am very happy that I now own this resource, and I think it will prove very useful as I continue my own research into the world of The Lord of the Rings. The Benedict Option: A Strategy for Christians in a Post-Christian Nation, written by Rod Dreher, was published in 2017 by Penguin Publishing Group. It is rather obvious that America has transitioned into a post-Christian nation. There are a few options of how Christians can handle this shift. This is the entire premise of The Benedict Option. Modeled conceptually after the monastic community of St. Benedict, Dreher suggests that it is more important for Christians to maintain a distinct identity and ride out the storm. This is not a surrender, but it is an intentional decision to make sure that Christianity survives, and he believes the best way to do that is to internally reinforce Christian communities. “Recognizing the toxins of modern secularism, as well as the fragmentation caused by relativism, Benedict Option Christians look to Scripture and to Benedict’s Rule for ways to cultivate practices and communities” (18, Kindle Edition). The obvious question you probably have relates to the practicality of such a project. After all, there seems to be less and less room in society for orthodox Christianity. Dreher fully recognizes that secular man has moved away from the conception that Christian doctrine matters at all. He quotes Brother Ignatius, a monk living in the Norcia monastic community in Italy who points out, “’The best defense is offense. You defend by attacking,’ Brother Ignatius said. ‘Let’s attack by expanding God’s kingdom—first in our hearts, then in our own families, and then in the world. Yes, you have to have borders, but our duty is not to let the borders stay there. We have to push outward, infinitely’” (73-74, Kindle Edition). This makes the project seem much more achievable. We first need to get our own lives in order. Dreher is not suggesting that everyone becomes a monk by any means, but he is suggesting that we need to intentionally think about our lives and what we do. We need to make sure that our own lives are evidence of right priorities and submission to God’s order. Once we do that, then we grow to our families and beyond. While we are focusing on our families and our local communities, we build institutions. Specifically, our churches need to reclaim their historical role of standing out in the world for goodness. “As times get uglier, the church will become brighter and brighter, drawing people to its light” (117, Kindle Edition). Once individual lives and churches are functioning appropriately, and often times working together across denominational lines whenever possible, Dreher believes that Christian education is necessary to counter the narrative of secular education in America. As the product of public education and a public university, I do not know that the situation is quite as bleak as Dreher suggests on this chapter, but I do take his point without a doubt that, “the pursuit of knowledge for its own sake has been slowly separated from the pursuit of virtue” (148, Kindle Edition). As I have studied in a Christian university for my MA as well as my current PhD, I will say that I feel like I receive a more complete education when the pursuit of virtue is intertwined with the pursuit of knowledge. Christian schools do that very well, and I certainly appreciate the point he makes. Ultimately, Dreher summarizes The Benedict Option by characterizing both what it is and is not. “The Benedict Option is not a technique for reversing the losses, political and otherwise, that Christians have suffered. It is not a strategy for turning back the clock to an imagined golden age. Still less is it a plan for constructing communities of the pure, cut off from the real world. To the contrary, the Benedict Option is a call to undertaking the long and patient work of reclaiming the real world from the artifice, alienation, and atomization of modern life” (236, Kindle Edition). This book is vitally important for Christians to consider. Historical Christianity has excelled when, even in hostile environments, Christians live like Christians. As at times become more difficult and it is harder to be a Christian in name only, those who stand for the name of Christ are going to need to return to Biblical truth. Not only that, but they need to build institutions to help the community and future generations carry on this great tradition. We are seeing an imminent flood, but if we start building the Ark right now, we will be able to survive the storm. Through the beauty of God reflected in the Christian life in the Christian community, we will help people searching for meaning amidst modernity and present an attractive alternative to so many bankrupt worldviews.